A beautiful morning near Kibbutz Lavi. The experience began in the city of Nazareth and ended four days and forty footmiles later in Capernaum, on the shore of the Sea of Galilee. 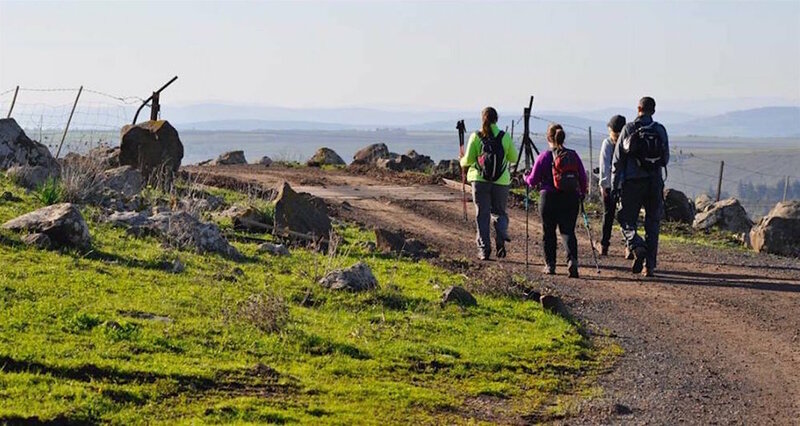 While not exact, the walk followed portions of a much older Roman path connecting the port of Ptolemais to two of Galilee's most significant cities: Sepphoris and Tiberias. Several sites along the way find connections with the Galilean story of Jesus: Nazareth, Sepphoris, Cana, Magdala, Tabgha, Mt of Beatitudes, and Capernaum. 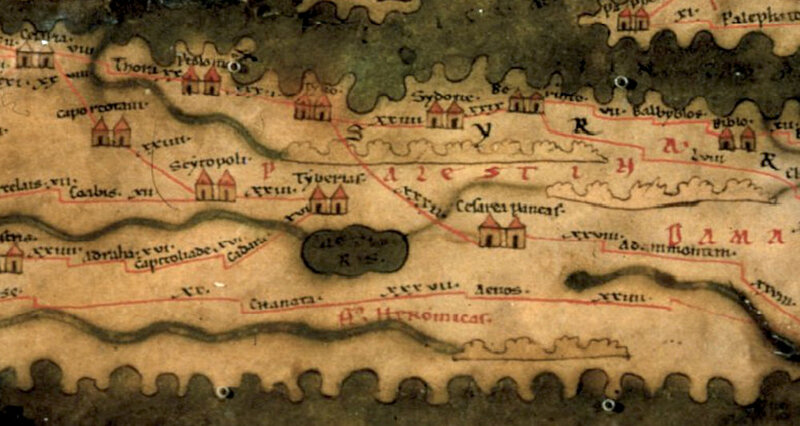 Detail from the Peutinger Map showing the area of Galilee. The map is east-oriented, so the Mediterranean Sea is at the top. The dark circle in the middle is labeled "La(cus) tyberias," indicating the Sea of Galilee. The red lines represent Roman roads. This map was produced in 1507 but was based upon a Roman military map of the 4th century. It draws its name from its discoverer. See here to find this image and a viewer for the entire map. Our journey followed a segment of the larger Roman road network in the region. Rain and snow often fall on Galilee in the winter months so was decided not to camp along the way. Local lodging was used for overnights. While purists may scoff, it was delightful to end each day of hiking with a hot shower, buffet dinner, and soft bed! Kibbutz Lavi (Lavi) and the Royal Plaza (Tiberias) provided these and more. Portions of the trail run through urban areas. We climbed out of Nazareth under a winter sky. As it turned out, the weather couldn't have been any better. Despite experiencing the wettest December in twenty years, hike days were sunny and warm with afternoon temperatures often reaching into the 60's. There was not a drop of rain. Somebody must have been praying! Only occasionally did the mud get the better of us. Here, it pulled poor Tracy's shoe off! Travel highlights included the Church of the Annunciation in Nazareth, the ruins of the Galilean capital at Sepphoris, an Ottoman era mill, two spectacular synagogues, the burial site of Jethro (the father-in-law of Moses), and the house of Simon Peter in Capernaum. Every church we visited was festively decorated in the colors of the season. Here, at the altar where tradition suggests that Mary received the announcement that she would bear a son, a model of the Christ-child is flanked by colorful poinsettias. More natural highlights included sweeping vistas from Mt Hermon to the Sea of Galilee, herds of (roe?) deer climbing in the rocks far above our heads, miles and miles of olive groves, a serendipitous meeting with a shepherd and his flock, and creeping through a looming canyon known as the Wadi Hamam. An iconic view to sheep in an olive grove. In an unexpected surprise, we even had one engagement celebration. See here for more. Mud was our most challenging opponent. Walking sticks and helping hands proved to be a great asset. Plans for repeating this Jesus Trail experience in January of 2018 are underway. Direct all inquiries to markziese@gmail.com if interested. All travel was organized by the Jerusalem Center for Biblical Studies (JCBS). On-ground transport was facilitated by George Garabedian and Company. A special thanks must be given to "Johnny Magic," the cheerful wheelman of our purple bus who went where few drivers dare to go. There was some good chemistry in this group. Nearly all the pictures featured in this post are courtesy of Kim Wilcoxon. Since she is a lawyer, I figured I had better give her credit, lest something worse befall me.